Kamar Baldwin brings the ball up the court against Tiffin. Baldwin led Butler with 17 points in the team’s 100-63 win over Tiffin to open exhibition play. Photo by Jimmy Lafakis. Playing without the second-highest scorer in program history in their starting lineup for the first time since March 2017, the Butler men’s basketball team had no problem finding offense. Nine Bulldogs scored at least seven points and six tallied double digits as the Bulldogs soundly defeated Tiffin University 100-63 to begin their exhibition schedule on Oct. 28 at Hinkle Fieldhouse. 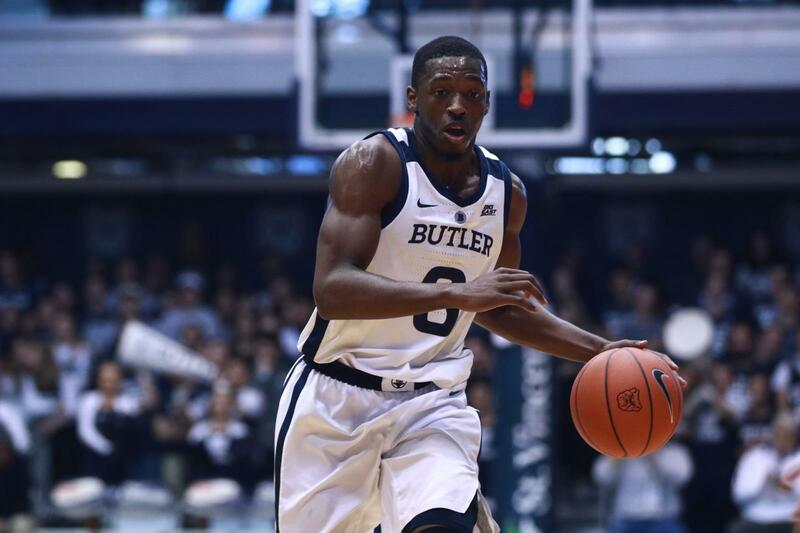 After missing a number of open shots early, Butler found offense from junior guard Kamar Baldwin, who scored all eleven of his first half points in a 2 ½ minute period. Baldwin scored three more times in the second half to finish with a team-high 17 points along with eight rebounds and five assists. Henry Baddley contributed 15 points, with all coming in the second half, while Sean McDermott scored 14. Paul Jorgensen and Joey Brunk each tallied 11 points, and Brunk tied Baldwin with eight rebounds. After outscoring the Dragons 45-31 in the first half, the Bulldogs converted nine of their first 13 field goal attempts in the second half to widen their lead. Butler shot nearly 60 percent from the field in the second half to bring their game mark to 55 percent, compared to Tiffin’s 39 percent. The Bulldogs also forced 18 turnovers which resulted in 24 points. McDermott said he thinks the team’s offense is improved from where it was at this point a season ago. Butler will host Southern Indiana on Saturday, Nov. 3, in their second and final exhibition game of the season. The team opens regular season play at home against Miami of Ohio on Nov. 10.